Spending a little over a year saving up cash and selling everything we own before this trip taught us several lessons. One of the most important was the value of money, and the rate that its value diminishes when you buy new things. We sold a tonne of stuff before we left home, much of it lightly used, and all of it at prices far lower than we paid for it. To say it was depressing would be an understatement. We also learned that there is a thriving used goods market back home. Between garage sales, free online classified ads, and eBay you can pretty much find anything you need without paying full price if you have a little patience. Before we left home, we both vowed two things: 1) Never to buy new if we could find what we wanted used, and 2) Never buy more stuff than we absolutely need. Nice to haves are just not worth the money they cost, especially when all they do is collect dust. Now, Central America has taught me a new lesson. You can fix pretty much everything. There’s no need to throw something out just because it’s old and broken. 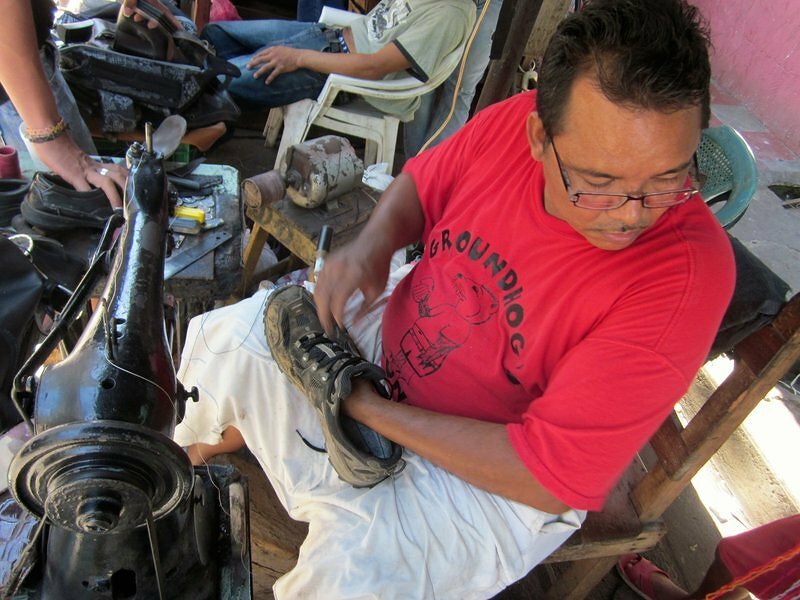 In pretty much every Central American city, you can find people out on the street who will fix whatever needs fixing at very reasonable prices. Between Granada and León, I tested their skill on several items. First, my watch strap had started to come apart. 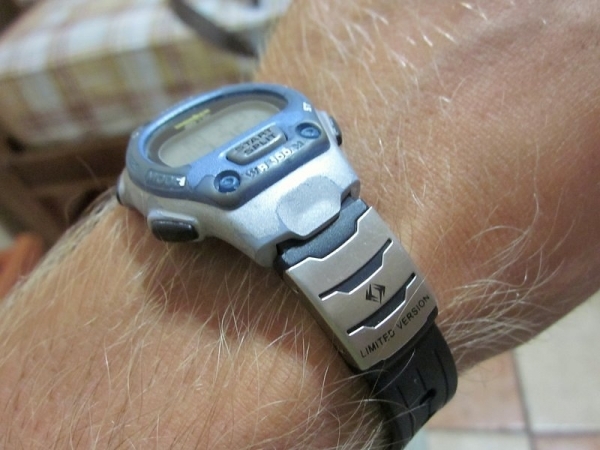 This is a classic Timex Ironman watch that Ashley purchased way back in the 20th century. Back home, I probably would have considered a watch that lasted me more than 10 years a good deal, tossed it out, and bought a new one. But we just bought a new watch in Utila (a time piece is required for diving) and it cost $23 dollars. That’s a lot of money in Central America. So what did it cost me to fix the watch strap and put a new battery in? Only about $5, and it’ll probably last another decade. The next things to go were my shoes. They are a little over a year old, and have plenty of tread left. 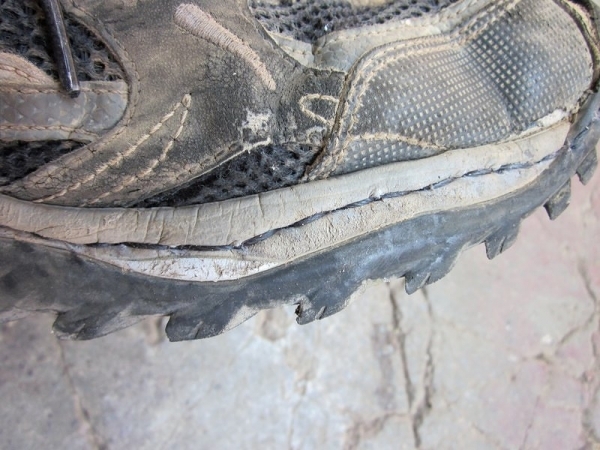 Unfortunately, all of our volcano hiking has done a number on them, and the soles were separating from the tops. They looked like they were talking. I was lucky enough to notice a sign in the market of Granada for shoe repairs. Behind the sign sat a gentleman with some thread, a screwdriver, and a sewing machine. He took a quick look, then for a mere $2 sewed them back up right as rain. Even used, it’s hard to find a good pair of shoes for $2, and these ones are already broken in. I needed one more repair before I left Granada. One of the screws that hold my glasses together had rusted through and snapped. My right lens fell out, and there was no way for me to remove or replace the screw with the tools I had. A quick trip to a jewellery store, to make use of a tiny drill press and another to an optical store, and my glasses were good as new for the low low price of $1.50. 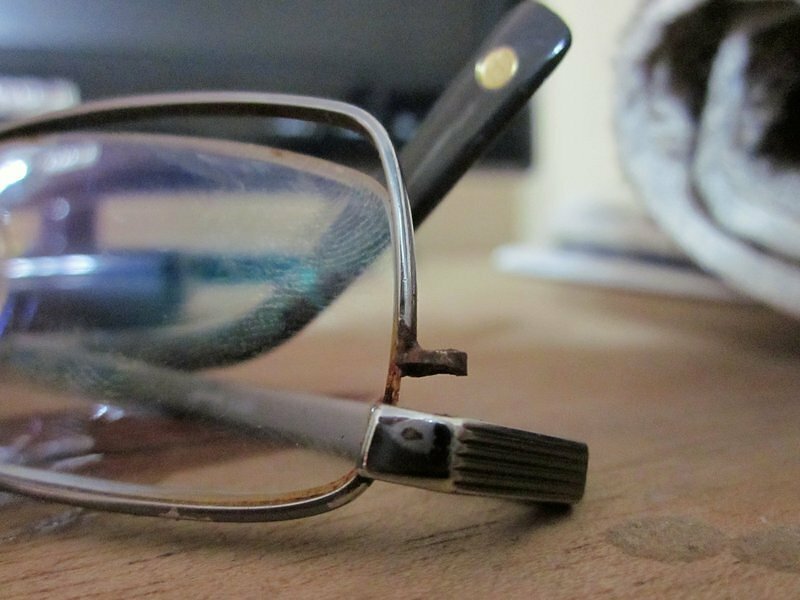 Actually, I´m lying a bit, they are not quite as good as new because I dropped my lens on the street while walking to the jewellery store and a small chunk of glass chipped out. But they will serve for another year at least. All in all, I fixed my watch, a pair of shoes, and my glasses for about $8.50. Back home, I would have tossed everything out and spent at least $200 replacing them. Sure, I’ll still need to replace them at some point, but probably not this year. My world just got a whole lot less disposable. I don’t know how you guys feel about ordering online but Zenni Optical has really cheap glasses, way cheaper than buying back home. Glad you found cheap repair places, wish the costs to repair things were that low here. I need to get some shoes stretched out and I’ve tried the manual shoe stretchers that I purchased off ebay and no luck. Fully with you guys on buying used or at least researching and finding the cheapest place to buy something. Actually, glasses in Central America are quite cheap as well. I was looking at some prices before mine even broke, and figured they were about 1/3rd the price as back home. I hope these ones keep trucking for a while yet, but when they do give up the ghost, I’ll have to figure out where I can get a cheap replacement pair from. Unfortunately, I haven’t seen too many places selling used eye glasses.